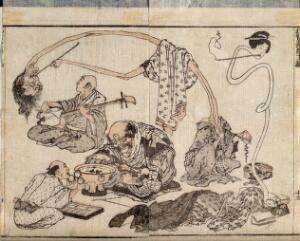 A man with three eyes is fitted with spectacles, watched by a man and woman with fantastically elongated necks, both smoking pipes; a Buddhist monk (?) playing a shamisen looks away. 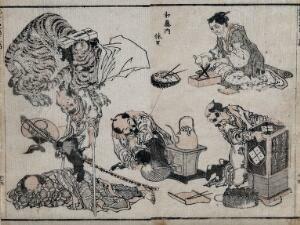 Coloured woodcut by K. Hokusai, 1834. A communal bath house: women and children washing, a Buddhist nun shaving her head. Coloured woodcut by Hokusai, 1834. 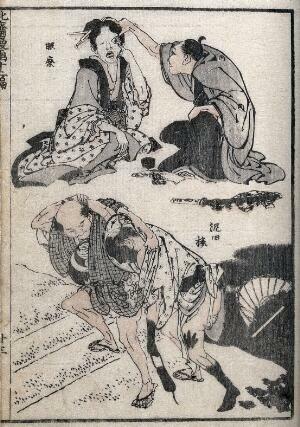 A samurai in a latrine; outside, his three attendants hold their noses. 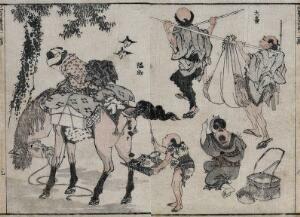 Coloured woodcut by Hokusai, 1834. Left, a small man (a dwarf?) 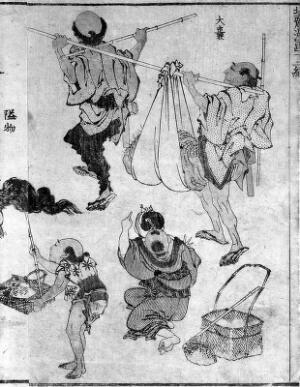 lifts a horse's tail with a bamboo rod to catch its faeces in a scoop; above right, a man with filarial elephantiasis is helped to carry his enlarged scrotum supported with a sling; below right, a woman carrying a baby on her back points in amazement. 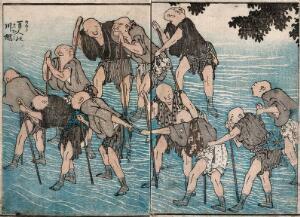 Coloured woodcut by K. Hokusai, 1834. Above left, a tiger (?) 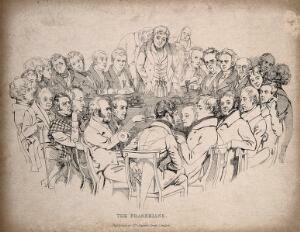 restrained with a collar and a cloth over its head; left, a man on crutches steps over a sleeping man; centre, a man fans a stove on which a kettle is placed, watched by a man (right) kneeling by a cabinet (? ); above right, an old woman sharpens (?) a knife. Coloured woodcut by Hokusai, 1834.